We are pleased to announce that registration for the Law Union’s Spring 2019 Annual Conference is open! You have four weeks to register your attendance on Eventbrite. 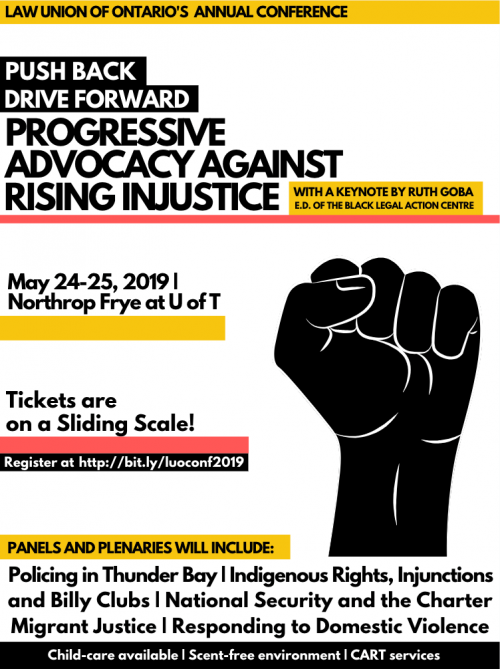 This year’s program brings together practitioners and community experts on topics such as policing, migrant justice, Indigenous litigation strategies, the rule of law, and national security. We are particularly excited about this year’s keynote speech, which will be provided by Ruth Goba, Executive Director of Ontario’s new Black Legal Action Centre. Ms. Goba will speak on Anti-Black Racism and the Law. Additional details regarding panelists and CPD will be provided shortly on the Conference Facebook Page.As always, the event is pay what you can and no one will be turned away for lack of funds. Suggested donations are provided on Eventbrite, and payment will be accepted on-site by cheque, cash, and credit card.